Great to see these rare photographs of Captain Strange - so, how did you and The Captain (aka John Bunclark) get to know each other? I never called John 'The Captain', though I know a lot of people did. We were classmates at school. 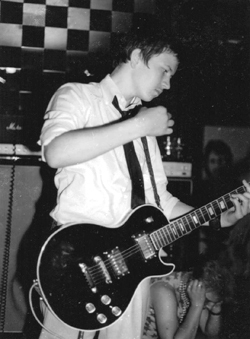 He said he was going to form a band (always had plenty of front, and ended up as the front man of course), so I bought a guitar and even paid for lessons, just so that I could make sure I got in it. We were in the same year, but he was a little older, and looked it. I was 15 - and looked it. The year we did those few gigs was 1979! Who took those great photographs from Scamps / Shrimpers, and what caused the band to split? I loved every minute of it, but in August of that year, as I just turned 16, my parents moved to bleedin' Cornwall (nice place for a holiday, but what a difference from Southend! They were at least a year behind the trends), so that was the end of Captain Strange. Got myself back to Essex seven years later. The pics are originals from my scrapbook of the time. I think these were from John's camera, or his dad's? Taken by whoever he gave it to before the gigs? 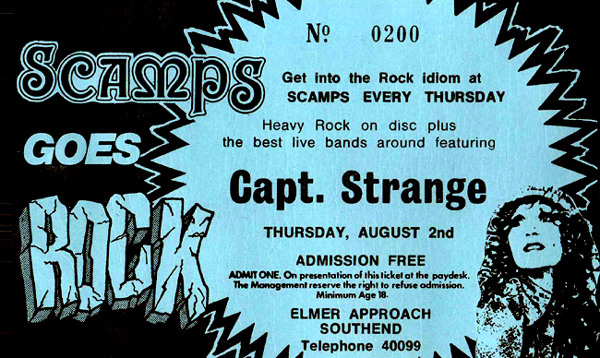 The Scamps gig was our last – and we were supposed to be the headline act! 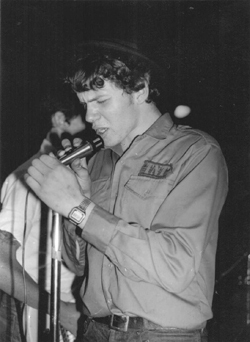 – incredibly John had persuaded them to give us this gig, and we even had the Vicars in support! I have no idea how John managed to organise this, and god knows what the Vicars thought when they saw us perform! The gig at St Saviours Hall in Chalkwell looks like a great bill - did that full line up all actually appear? 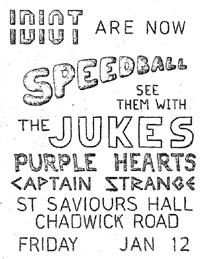 The gig with Speedball and the Purple Hearts did take place, but we didn't perform. Typical John, we had virtually only conceived the band, never mind practiced (or even got a full line up), and he had arranged a gig for us. The Purple Hearts were there - before they got a bit of fame obviously. I can't remember if all members of the band were there, I think maybe not, but pretty sure they did not perform either, for whatever reason. Speedball did - I remember them doing Ging Gang Gooley in the old Church / Scout hut! They may well have been the only band to play that night - not sure if it was even ended early by the vicar (or whatever the title) who might have been shocked to see what was going on in the hall (I think maybe another John Bunclark enterprise that had been "sold" to someone!). Was Sue Paget from The Vandals in Captain Strange for long? She practiced with us, but never gigged. Did you make any recordings? I seem to remember a tape, and think I had a copy, but long since gone I'm afraid. Looking back at the band now, what are your thoughts? I Kept a couple of cuttings from the time - (mainly from Strange Stories of course!) - that sum things up well: "bands that played in Heat 4 were; Capt. Strange a loud noisy band from Westcliff who didn't have a lot to offer apart from volume and youth." We finished 5th out of the 6 that night. I think we managed to avoid being bottom, as Paul Shuttleworth was one of the judges, and my older brother was with him in Surly Bird pre-Kursaals (think he may have given us a better score out of sympathy). We only had three songs, played them, and then it was pointed out that we had only used around half of our allotted time. So we played them again! As Andi said in his profile - it was a wall of sound, and I’m not sure that all of the judges actually knew they were listening to the same three songs? Also, "following them was Capt. Strange who drove me to find even more liquid solace which impaired my faculties to such an extent that I missed The Electric Shocks (sorry lads)..." This was our gig at the Esplanade, where we had no drummer, so John Dee offered to help out. He played with one drum stick and an empty beer bottle!